Anne de Vries, Listening with Snail, 2015, high-density foam, MagicSculpt, synthetic hair, 32 x 20 x 4". Olga Balema and Anne de Vries’s “Listening” offers several weirdly supple sculpted riffs on aural physiology—that is, ears. 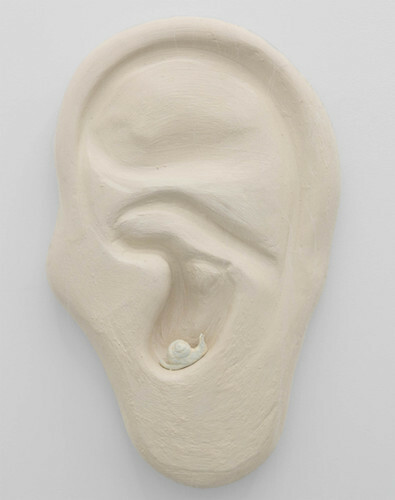 In the most literal example, de Vries’s Listening to Snail (all works 2015), the small, whorled shell of the titular mollusk sits in the hollow of a big plaster ear, echoing its curves. The tumorous lobes of his vacuum-formed Faces, shallow head-shaped pucks covered in abstract mounds, are printed with pixelated, nerve-like digital tracings. The double yellow bars of Apple Maps freeways and pictures of Apple earbuds cross the surface of Face 03, evoking a kind of technical evolution—an industrial ergonomics to amplify our species’ slow growth. Face 02, opposite, resembles a low-res tide pool which, though silent, hints at the ocean heard inside a conch—in point of fact, the resonating, primordial static of rushing blood. This soft, outsized morphology reaches gross scale in Balema’s House of Intuition sculptures: Mauve cables flop viscerally between kinked, rusty tubes; butterfly hair clips shelter in and around cyst-like sacs of Magic-Sculpt. On the floor of both gallery rooms, Balema installs surf-worn rocks (Gut Feeling I–III) fitted with worms of clay in shallow grooves; saddled with cell-phone motors, their fingerlike forms clack against the stone, as if slowly burrowing. Wires, transformers, and extension cords wriggle from the motors, across the concrete floors, back to a “source”—both ancient and plastic.